It's as good a time as any for our 23 year-old aluminum fuel tank to develop a tiny pinhole leak. The nerve! But it's much better to have it here before we leave for the wilds of western Canada. So, another delay which we hope will be over soon. The new tank will be ready in a day or so and we'll install it, adjust the engine and then go. Our original departure date of May 15 was delayed by the last of Karen's physical therapy for a painful frozen shoulder. Delay is a word we should probably become more comfortable with, especially us Ancient Mariners. Nearly two months in the wilderness is another thing we plan to become comfortable with as soon as possible. We'll be back in late July. The new solar panel and inverter makes us energy-independent and free from the need to run the diesel on our 24-foot boat unless we need to. That feels very, very good. That name! 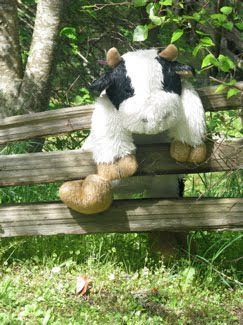 Sockdolager (sock DOLL-ajur) is an old 1800s word no longer in popular use, so Jim decided to bring it back. It means something outstanding, a knockout. People used to say, "That was a real sockdolager!" It's also the name of a set of rapids in the Grand Canyon's section of the Colorado River. Jim, being an experienced whitewater boatman, found the name irresistible. Some find it incomprehensible--at first. Now you know. Forewordplay Redux: For new readers, there was a post about this a year ago, but it's worth repeating. We didn't really set out on this blog to advertise a certain, um, "aspect" of our adventure, but there it is, writ large in every email: SEXCELLENT. Well, okay then. A new voyaging concept! Once we got over the astonishment that Google Blogspot would take out all the apostrophes and Spaces of Purity in the title (how dare they!) and make that our email address (shocking!) and once we landed in people's spam files and they had to click to confirm we weren't scumbag spammers and to allow us into their emails, and once Karen realized that not only would it be noticed, it would be VERY noticed (nyuk, nyuk) then we settled down to enjoying the arched eyebrows and winks. But just so you know, this is still a two-person boat. 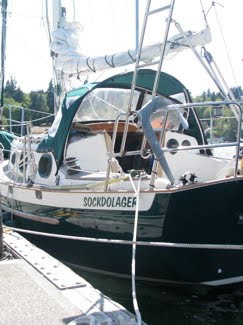 Minstrel is sold and Sockdolager sports lots of improvements as we ready her for cruising. This was taken by Hasse sailmakers off Port Townsend. “That I don't know where to start! I read Good Old Boat, you sail my favorite boat! Mrs. Larson mentions your ditch bag, but there was no mention of what items (she said you have the best equipped ditch bag around), I was wondering if a pro would be willing to share? List essentials for the ditch bag, for cruising onboard items, etc? And where can I get more info and boat pics from Dana 24s? 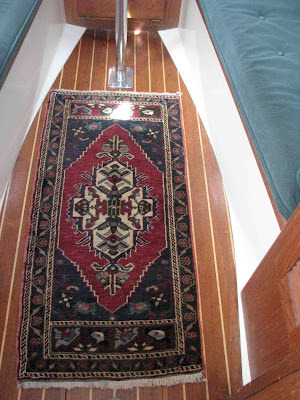 What other boats did you consider, or was it love at first sight? What about your first mate? What else did he consider or was there no comparison (boat-wise - I'm sure few women compare to you)? Any hints about changes or updates or additions that should be made to the Dana 24 prior to cruising? How about cold weather cruising (tropical born and raised here and interested in heading north at the end of plan, or should I say beginning? ), any tips? Same for your partner since you share the boats, is it fit for two? I've yet to find my first mate, but one should leave options opened by having some room on the boat, right? Spread some of that wisdom - I'm working on a 20 year plan and then I read an article about you doing exactly what I hope to do, you guys even picked the same boat I have my heart set on! for Dana info or to http://groups.yahoo.com/group/Flicka20/ for Flicka (Dana’s little sister) info. You’ll find a large group of enthusiastic owners of these boats happily sharing an encyclopedic amount of information and hundreds of photos on them. Next, join the Northwest Pacific Seacraft Owners Association, http://groups.yahoo.com/group/NWSeacraft/ which is the fun-loving group in Puget Sound now chaired by…Ta-Daaaaa! Jim Heumann! 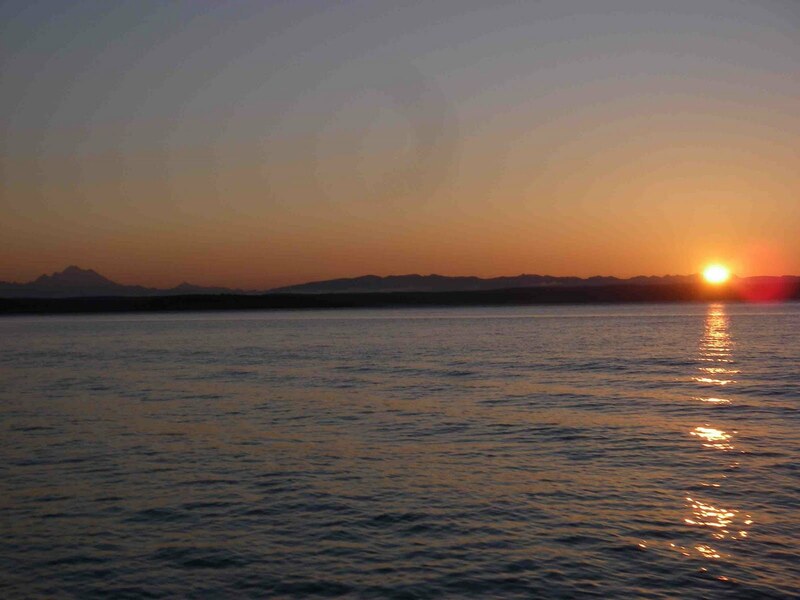 We have 4 rendezvous per year in different locations around Puget Sound, and you are welcome even if you don’t have a Dana or other Pacific Seacraft or don’t live in the northwest, but want one or want to see one, or couldn’t sail there but can drive there. Yes, join us. And if you’re looking for a new or used Dana, Tom and Max at Seacraft Yacht Sales in Seattle do a fine job. They’re also now the builders of the new Dana 24. http://www.seacraft.com/ There's a new video tour of the new Dana on the Seacraft site. 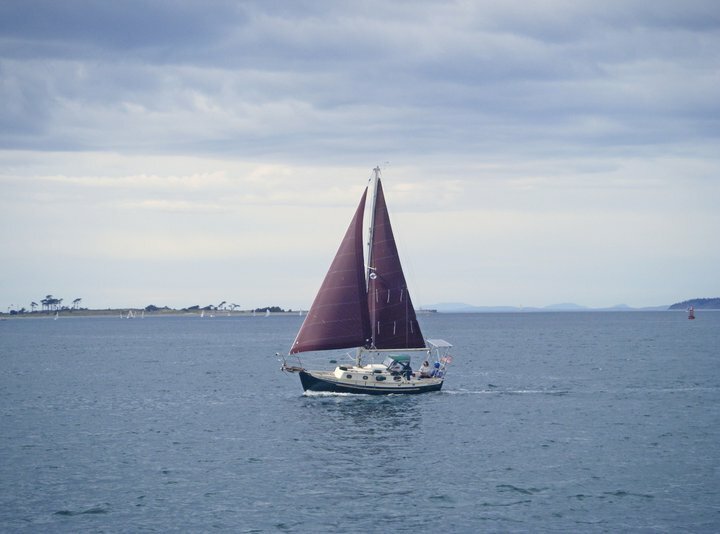 If you’re around Port Townsend from August 6-8, they are also hosting the Pacific Seacraft national rendezvous here, which promises to be mucho fun. Contact them via their web site if you decide to come. Sockdolager's new dodger and stainless arch, which supports her new solar panel. Next question: is the boat big enough for two and does it have enough room? Well heck, a double kayak is big enough for two. It’s a state of mind: how well do you get along, are you both roughly equal in skill and confidence, or is one of you over-challenged? 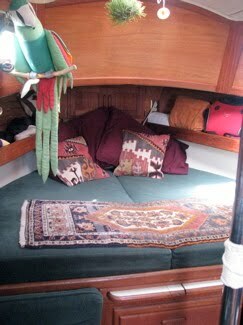 We find the Dana to be just big enough to cruise seriously in and still take all the food, water, wine, beer and books we need, yet small enough to fit almost anywhere and very, very fun to sail. If it was a smidge bigger we’d like it, but it’s enough. A lot of people think they need much larger boats so they buy too much boat and then the sheer size of the maintenance and sail handling scares and defeats them. Lin and Larry Pardey's advice still stands after all these years: Go simple. Go small. Go now. I'd add Go quality. Simple is in the eye of the owner, but small means lower dockage and haulout fees, smaller sails, engine, everything. But cheaply built boats are never cheap. Well-built small boats with proper seagoing design can take you anywhere. Who's the captain? Well, neither of us is the first mate-- we feel equal in skill and knowledge, which means at sea, we trust each other with our lives. And we share responsibilities equally, except for a few areas in which one tends to excel. For example, when it comes to mechanical or electrical there’s very little Jim can’t fix or figure out—he’s fearless. So I’m happy that he has the lead there. Thrilled, in fact. I’ve done celestial navigation and am probably more comfortable with piloting than he is. He’s happy that we have that kind of backup to GPS. I’ve taken meteorology and navigation courses, and he’s taken sail repair and rigging courses. I thought I was pretty good at tying knots, but Jim has long surpassed me. I’ve had more offshore experience than him, so that was helpful in setting up watchkeeping duties. Trusting your lives to each other is no small thing, but you can get there with practice and diligence and alertness. And patience. Lots of patience. Good Old Boat will be publishing a comedy piece by me on the subject of gender communications on a small boat in November. Next: What updates have been done? Jim will tell you all about that. But to put things in perspective, take the advice of long-term sailors Lin and Larry Pardey: 1) Keep the water out of the boat; 2) Keep yourselves ON the boat; and 3) Keep the boat moving. Cover those basics first: good maintenance, safety gear, ground tackle, and a sailboat’s “engines”--you need good sails in decent condition—this means storm sails (for offshore) as well as light air sails. A light air sail is not a luxury, it’s a necessity (see the upcoming July issue of Good Old Boat for reasons.) If I sound like I’m shilling for GOB it’s because they dish out loads of practical advice rather than shiny reviews of shiny boats no normal person can afford. Cold-weather cruising: I had a Webasto diesel forced-air heater (about $1500) installed under the starboard coaming in Minstrel and loved it for Alaskan cruising, but in Sockdolager we have a portable propane heater and don’t intend to install a permanent one because we’re heading south next year. One of Sockdolager's new Turkish rugs. Other boats under consideration when buying the Dana included the Flicka; both Jim and I independently considered Flickas, but found them just a bit too small for what we wanted. I considered a Cape Dory 27 (nice, but not Va-Voom), and a Cape George 31 (gorgeous but too expensive.) I also love Bristol Channel Cutters, but felt that the long bowsprit might be a lonely place out in the Gulf of Alaska; also, they’re very expensive unless you get lucky. But I still love them. After Jim bought his Dana (now our Dana), he also noticed the Shannon 28 and the Baba 30, but was very satisfied with his choice. The Dana is to pocket cruisers what a little Mercedes is to cars. Every boat's a trade-off. For other “comparables,” a good starting point is marine architect Ted Brewer’s comparisons of similar boats to the Dana in the May-June issue of Good Old Boat. He goes into detail about stability and sailing characteristics. See, you’re just gonna hafta go get that magazine. West Marine and lots of marina stores sell them. And finally, the ditch bags. Karen Larson has asked me to write an article for Good Old Boat on this, so you’ll have to wait. Except for Jealous, that is. I’ll send him photos and a writeup of the contents because he asked first. We hosted a rendezvous in April. On the way to a used bookstore on Bainbridge Island, Karen and her friend Patti (co-owner of the Dana Tonic) let things get a little out of control at a Turkish rug shop. They never made it to the bookstore. Karen is a sucker for a good Turkish rug. You are probably not going to believe this, but it's true. Readers of this blog know all about our fishing prowess, which went from zippo to adequate last summer only after herculean efforts that would rival walking on the moon, which some still question. Perhaps you could say this is one giant fish for man and one giant fish story for mankind. 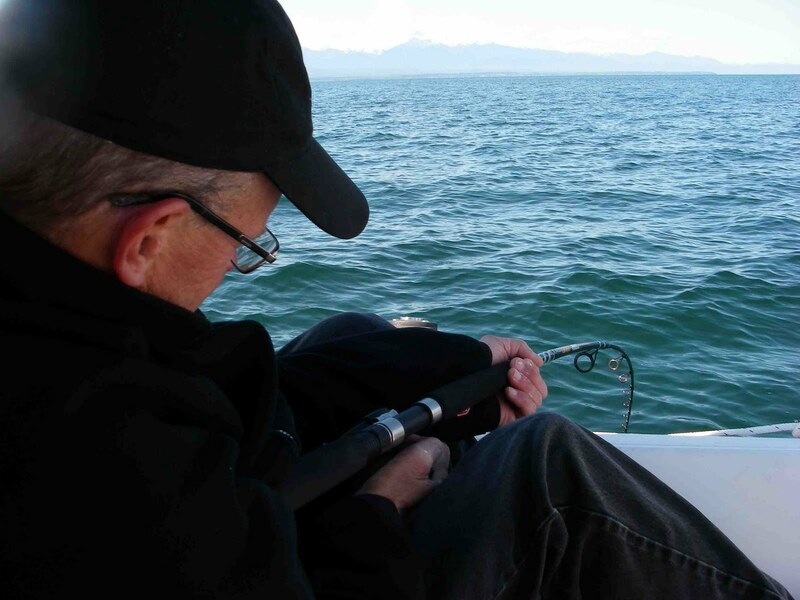 Codzilla took the double-hook herring bait on 40-lb test line, and--I swear I am not making this up—we, meaning our 8500-lb boat, did not move with the tide for 40 minutes. Seaweed passed us--backwards. The fish tussled minimally, which halibut do, so we knew we weren't snagged on the bottom and were probably hooked onto a lunker. I once caught a 100 pounder in Alaska, and this one was behaving the same way. Jim hung on with every ounce of strength. The photo doesn’t half tell the struggle, but Jim’s new nickname is “Dances With Halibuts.” His hands were aching. He couldn’t turn the reel at all, in fact the drag was overwhelmed and he had to hold it back. He didn’t dare move or else he’d lose the whole rig, that’s how hard and steady the fish was pulling. Every once in awhile it would struggle, so we knew it was a fish and not the bottom. The brand-new rod bent waaaaay over, almost to the water. We thought it might break. We were amazed that the line held, but we had 150 feet out so it was a bit stretchy. I lifted the rod tip because Jim couldn't, and then I’d lower it fast and he'd crank in a few inches every couple of minutes. We managed to wind in 50 feet over 40 minutes, with 100 feet still out and bar-taut. I mean, it was playable like a guitar string. We knew we couldn’t boat such a fish, but we hoped to get a look at it and perhaps cut the wire leader. Lift, crank… lift, crank. 100 feet to go. Then the line broke. Dang! That was one big fish! What kind of fish will do that? An Ohio-class submarine? We’re taking guesses. Fisherpersons, do some math. How big do you think the one that got away was? We haven't figured out how to make the comments section user-friendly, but if you can, leave a comment.